Working away from 'home', my route from Kings Cross took in Fitzrovia and Soho. I've passed through Fitzrovia countless times over the years, but never by exactly the same route. I always know roughly where I'm going but never precisely, the Post Office Tower acting as a sort of surrogate compass when a reference point is needed. 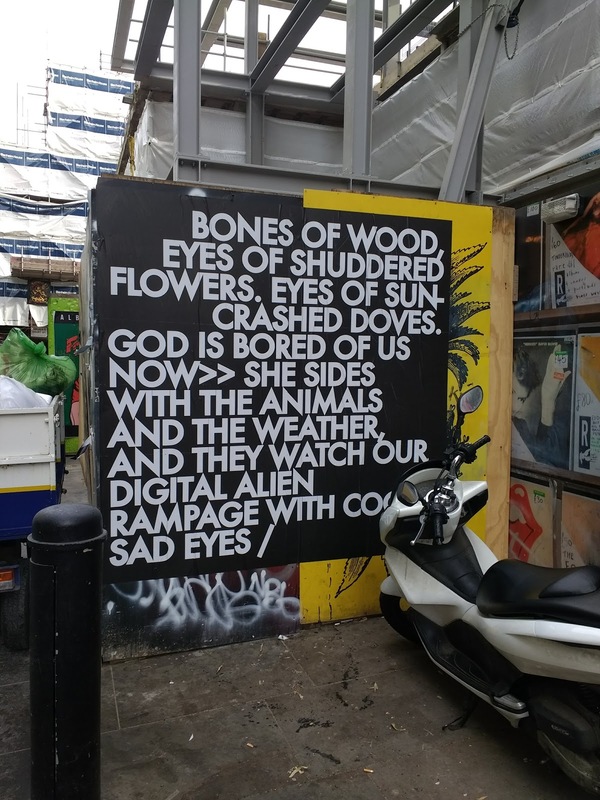 In Fitzrovia I encountered dipictions of two figures. 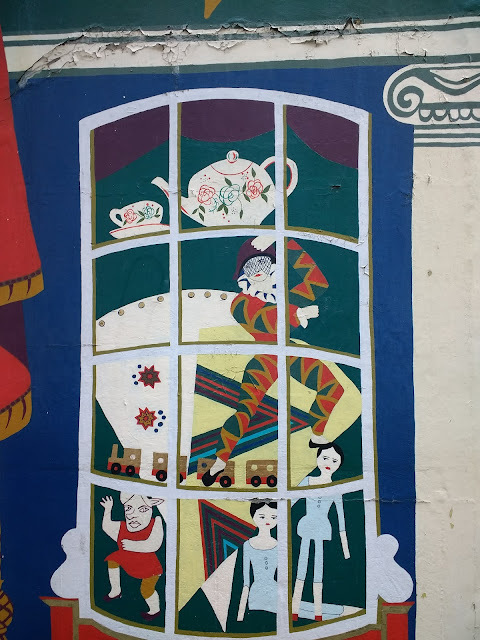 The first a Harlequin, painted on the exterior of a bizarre toy shop that appeared to belong to an earlier age. Pollock's Toy Museum does indeed date back to the 1960s but it felt like it had been there much longer. The strange Victorian toys in the window display made it more akin to a cabinet of curiosities than a Hamleys or Toys R Us. While in the immediate vicinity of the shop I briefly felt transported back to a different time, a slightly sinister foggy one, with a cane wielding top hatted Lon Chaney figure lurking on each corner instead of a Japanese sushi takeaway establishment. The moment passed as I left the shop's field of gravity and was thrust back into contemporary Fitzrovia. A safer, more sober and less interesting place than in my brief imaginings or it's much written about postwar heydey. The Harlequin, a character dressed in a mulicoloured diamond costume and usually wearing a black mask, originates from the Italian comedia del'arrte. The character is associated with both foolishness (possibly contrived in order to confuse and cause chaos) and trickery. The Harlequin is also associated with dextrous physical acrobatic skills. A variation on the character arrived in England in the 1700s and a bit later was paired up with the contrasting clown figure, developed by Joseph Gramaldi (who is buried a couple of miles away in the park named after him near Angel, where you can dance on his grave and make it play a tune). The Harlequin, along with the Jester, was used extensively in the symbolism of Marillion's record covers and song lyrics in the 80s. This association brought about a slightly unwelcome earworm. I needed something a bit more upbeat than Fish's pained wailings at this time of the morning. 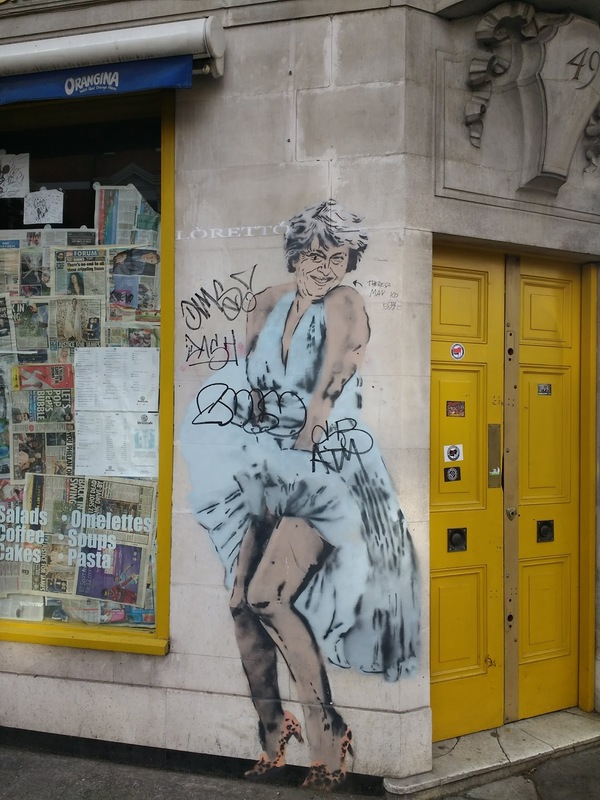 The second figure I discovered in Fitzrovia was a grotesque Teresa May/Marilyn Monroe hybrid. An apparition as horrific as it was no doubt intended. The shop it was painted on had closed, the window newspapered up. A situation no doubt exacerbated by the malevolent presence of Marilyn-Teresa. Parts of Fitzrovia are being disrupted by Cross Rail. A cynic might say a sneaky excuse for getting rid of the remaining interesting pubs, cafes and restaurants to replace them with the latest corporate number nine models. I noticed, with alarm, that the Sam Smith's pub 'The Champion' was being refurbished. I wondered why, it was perfectly alright last time I went in. The wooden, William morris-ey darkness of Sam Smith's pubs are always welcome places of escape. I hope they don't spoil it. There is another up the road, The Blue Posts and I'm sure I've once been in a third in Fitzrovia but i've never been able to find it since. The Harlequin, is often characterised as a trickster or devil, a bringer of chaos, the fun sort of chaos. The Marylin-Teresa figure seemed to represent the exact opposite. An authoritarian order of brightly lit dull piped music temperate horror where you do what you are told to do or suffer the consequences. I'm siding with the Harlequin and will shout him a pint in the 'Posts. Across the divide of Oxford Street into Soho, I found myself near the axis of Berwick Street/Great Marlborough Street. More depictions of May. In one she is in a band with the Queen and Angela Merkel called 'The Dominatrixes', all three dressed as such. A horrific and disturbing vision which I was still trying to wash from my mind some time later. On Berwick Street market, things were no less disturbing. Since I'd last visited, the shops under Kemp House, a large tower block that rises above the market, have been hidden behind boarding pending development. On one of the boards were images of LP covers from the Reckless Records shop. Reckless was never located here and still operates down the road. It was a place I used to go to a lot 'back in the day' when Reckless Records own label released a string of LPs by The Bevis Frond, still a musical favourite and a figure intertwined with London as it exists in my head. Under Kemp House had been Sister Ray, which moved up the road a while back, and Music and Video Exchange which has gone from not far away to where the sign above currently stands never to return. The words, next to the Reckless covers, seemed to convey a spirit of defeat and resignation to the development to come. I left the market hoping it would still be here next time I visited. Soon after I passed The John Snow', another Sam Smith's Pub, one I've never been in. Named after a Dr who discovered cholera is caused by drinking water infected by sewage, rather than 'dirty air' as was thought at the time. Not the Channel 4 news presenter (Jon). Soon after I'd crossed Regent Street and New Bond Street and was in the heart of Mayfair. An area I have rarely visited and one I associate with dull exclusivity. From this vantage, Fitzrovia and Soho still seemed like places that still belonged to the Harlequin. A barmy morning, I took a slightly convoluted route to work. Only an extra 10 minutes added to the 'direct' route but enough time for a diversion from the norm. 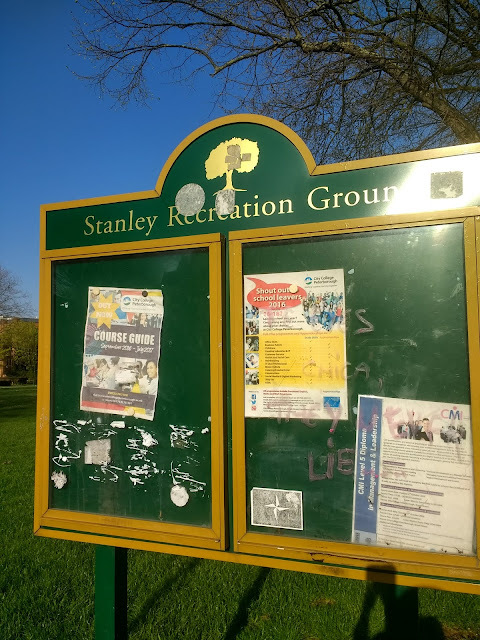 This resulted in crossing the Stanley Recreation Ground. In the morning sun it looked enticing from a distance. Upon reaching its edges, I made my way across a desire path towards the main 'official' path. The rec felt quite pleasant in a rough grass slightly littery sort of way. No manicured straight line gardens or park keepers here. I came across what looked like the base of a missing statue. I imagined a stone figure becoming animated and extracting itself from the base before wandering off across the grass in the manner of a Ray Harryhausen creation. 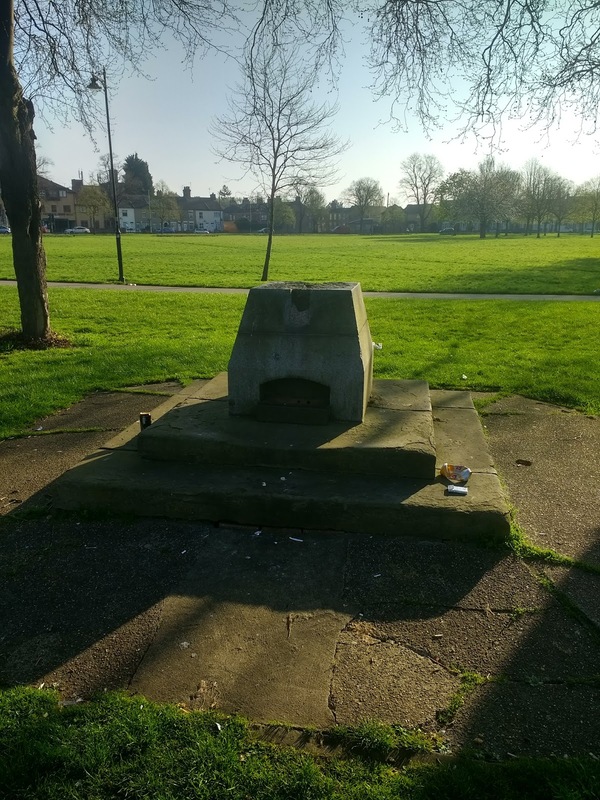 The remaining base resembled an altar, with a few offerings of empty beer cans and fag butts placed on or around it. Not far away a group of people occupied a bench which had a far more impressive array of similar detritus strewn about it. People for whom 8 in the morning wasn't too early for a tin of brew. Disciples of the missing statue, perhaps. Leaving the Rec I passed the 'official' notice board. Pretty much unused apart from by the City College who had stuck a few random notices behind the glass in 2016. Some unofficial additions included a black and white sticker bearing a mysterious symbol of a four pointed star or possibly a compass. Possibly navigational, but if so too cryptic to be desiphered. I didn't notice at first the quote from Al Pacino in Scarface graffittied across one side: 'The eyes Chica, they never lie'. Out of context, on rec in Peterborough, this sounded more like a warning than advice on picking up women for Cuban gangsters. Similarly cryptic to the star/compass. Pondering this and the similarly baffling statue-altar I left for work. Friday. Last day before a week off. I decided a longer lunchtime walk was in order. I headed to Stanground. I'd seen it from the train with its bungalows resting on the waters edge. And a church spire which I decided I would try and reach. 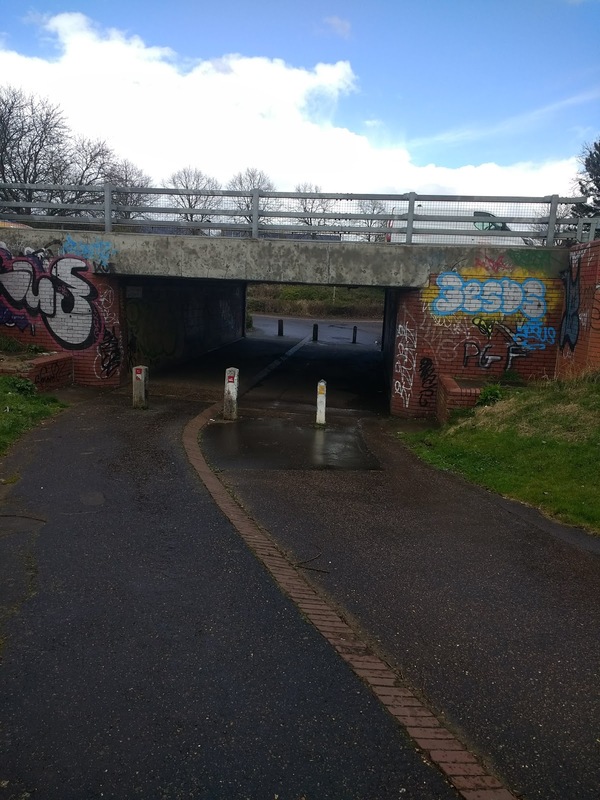 At the end of Fletton Avenue I followed the road under a flyover. One of a confluence of several roads passing through the behemoth of concrete led me into Stanground Village. I turned left onto what I think was the Highstreet, opposite a light-industrial yard containing a tattoo parlour. The area featured a couple of MOT garages and used car places. I spotted a pub, The Golden Lion. Boarded up, permanently closed, a drink out of the question. Opposite a chip shop which was almost tempting. Although I was only just outside of Peterborough the village could have been miles away, in the middle of nowhere. It retained some of the atmosphere of other places in the city but felt cut off, temporally and spactially. For a few minutes I forgot where I was. I could have been in one of the more crumbly and run down villages of Cornwall as easily as the bit of England which is half East Midlands, half East Anglia. After I passed the Baptist Church, house in a brown 1930s type building that could have passed as an old workshop, the houses began to look more salubrious. Smarter terraces and old cottages. Soon I was at the church who's spire I had seen from the train. I followed the path past it. I took an old man walking ahead of me as a barometer of safety. I wasn't sure where it would lead. I crossed a brook, running along some bungalows similar to the ones seen from the train. A path ran alongside, I noted for a possible future wander. The houses looked pleasant. Although one was sporting a St George's flag on a large pole in the garden. Possibly too soon for the world cup.. The path continued through an underpass, splendidly tiled. As I passed through, a cyclist was appeared from the blinding light at the other end. Instead of emerging into some sort of heavenly nirvana, when I came out the other side I recognised the path back across the dual carriageway that I had walked over on a previous excursion. My route back to work. The first day that felt like Spring. Sunny, warmer but not too warm. Perfect day for a walk. I decided to head up Eastfield Road and keep going to see where it led. Past the area containing the dilapidated looking pub 'The Sportsman', various shops and takeaways and the entrance to the graveyard, the houses start getting a bit bigger, first 1930s bay windowed semis, then bigger victoriana. One large house hosted a use car business and others old people's homes, a common use of larger houses in Peterborough. A petrol station with a Costcutter attached on on side and unusually a Chinese restaurant, including mock pagodas on the other. By this time I think I had entered the area known as ''Newark". The sign I'd seen yesterday had referred to this place, rather than the Newark near Nottingham. Now it made sense. 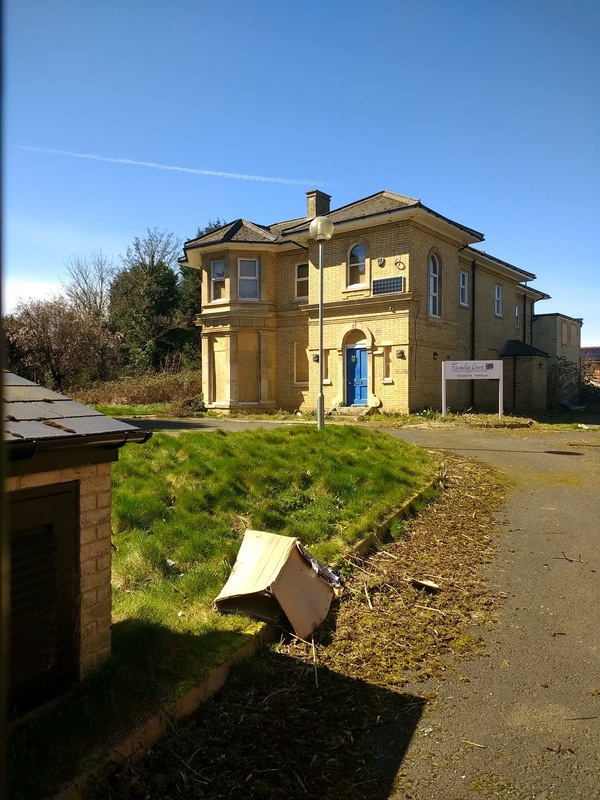 I passed a large house, currently in disuse but apparently acquired as a 'development opportunity'. I'd thought care homes were even bigger money-spinner a than residential developments. It seems even these establishments are not immune. The building had a slightly spooky air, somehow exacerbated by the abandoned cardboard box in the foreground. Maybe it had contained the belongings of a former resident, dropped in the struggle to leave by the eviction deadline. An absurd scene came into my mind. A struggle between the carers and elderly residents with bailiffs and representatives of the developers. Short-lived and one sided. I carried on. After passing the extensive low rise Regional College, I was drawn off Eastfield Road down a path alongside the college's playing fields. I could see a green space the other side and thought I could stop for lunch. It turned out to be a grass verge alongside a fairly recent housing development. The path eventually came to a sudden and unexpected dead end. I was diverted through the housing estate, and eventually onto a main road heading west (possibly). The road was residential to begin with, possibly 1930s vintage. Further up a few shops and an MOT garage, including a large Fish and Chip shop. Noted for future reference. The road bent round into the direction of the City Centre (I hoped..I'd already extended my lunchtime and must have been a good 20 minutes from work). I passed a pub, The Elm Tree. It seemed unsure as to whether it was open. A large function room had an advert for the Circus on the door. I couldn't tell if it was contemporary. Further along a flat roofed brown 30s(?) building, of the simple type used for community halls and scout headquarters. 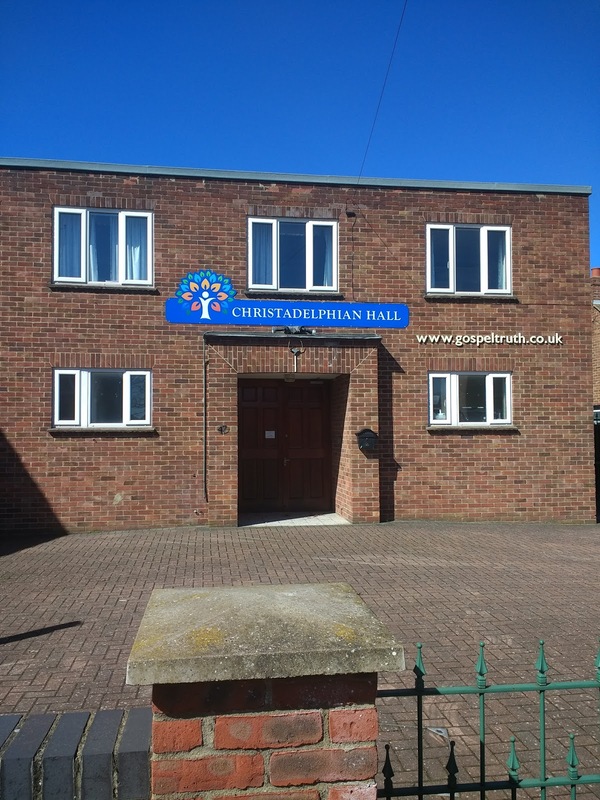 A building with potential as an excellent community facility. But currrently housing the Christadelphians, one of the many small, obsure and a bit sinister Christian sects that seem to find homes in these sorts of places. I hurried past, not wanting to risk being accosted by someone trying to talk to me about god, and headed back to work. After a bit of a hiatus of late on the lunchtime walking front, I got back out today for a brief and slightly wet wander. I headed down the path where I previously encountered Trainspotter Man, and had turned back. No sign of him today and I continued beyond the back of the indoor bowls club, a brown utilitarian building reminiscent of something from Prisoner Cell Block H. Being separated by a fence very similar to the sort you get near railway tracks enhanced the feeling. Just past here I past the only person I'd seen since leaving Star Road. A young woman glued to her smartphone, causing her to wander like someone half pissed. Small child in tow. She didn't look up when I passed. 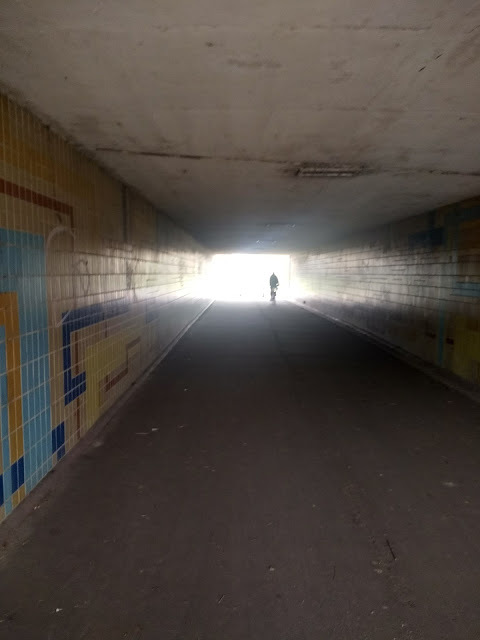 I reached the underpass I had been trying to find before. I went through, not sure what I would encounter on the other side. I passed a young couple looking a bit shifty as I went under. They might have thought the same about me I suppose. Beyond was a path/cycle way following the route of the Parkway. Just beyond that houses. 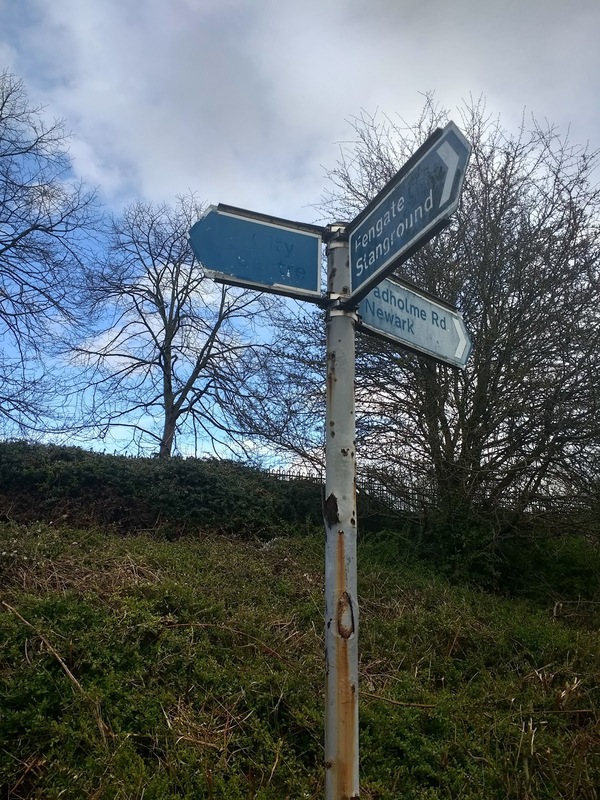 A signpost showed the way to Fletton and Stanground in one direction, Newark in another, and nothing in the direction I was going in to head back in the direction of work. A blank. I thought of London being erased by 'No' in the film The Nine Lives of Tomas Katz. I carried on through a street of brown flats and houses towards the non-event of the afternoon ahead at work.